One of my most popular projects is the Digital Holga – or the Holga 120d. I originally started this project as I wanted a convenient case to house my Raspberry Pi camera projects in – and many of the commercially available cases were a bit ugly. This is a Holga 120 medium format camera, with most of the insides removed and a Raspberry Pi (model A) and Raspberry Pi camera board added. I built a simple circuit board to control the camera shutter, offer a couple of creative modes and a couple of LEDs to provide feedback in the viewfinder when the camera is taking a photo. There’s space to attach filters to the front of the camera with a standard 49mm filter ring. Combined with an external USB battery the camera will work all day, and if you need a viewfinder it’s possible to use apps like RaspiCam to capture images in real time or remotely. So far I’ve experimented with an ASCII photo mode as one of the creative options for the Holga 120d. I’ve had a lot of interest in the project – and am considering a version 2. Unfortunately it’s not possible to use the Holga lens without having to do some quite destructive / fiddly hacking to the Raspberry Pi camera board. I’m looking at alternative camera modules to use. 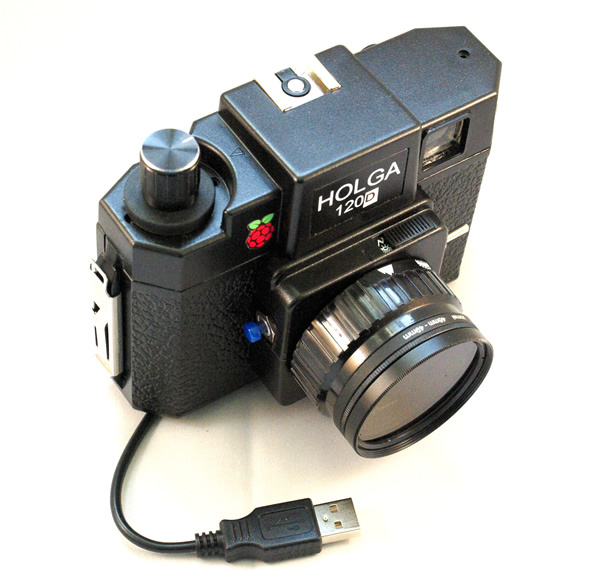 My thoughts for a version 2 are either – design a ‘Holga inspired’ camera case for the Raspberry Pi or put together a kit which converts a Holga into a digital camera more easily (and without having to Dremel out the insides). If you’d like to be kept informed of when I launch a kit – please sign up to my email list below.